New Managing Director of Bahamasair Holdings Tracy J. Cooper (second left), widow of the former Managing Director Henry Woods’ wife Gayle (centre), and Valentine Grimes, Chairman of the Board at Bahamasair (right) attend a reception announcing the appointment of the new Managing Director and other Executive Managers at Bahamasair Holdings, Thursday, February 9, 2017. NASSAU, The Bahamas — Chairman of Bahamasair Holdings Ltd. Valentine Grimes announced that Tracy J. Cooper, a 31-year veteran of the national flag carrier is its new Managing Director during a reception announcing the appointment of the new Managing Director and other Executive Managers at Bahamasair Holdings, Thursday, February 9, 2017. The Chairman explained that Mr. Cooper was most recently the Director of Maintenance and he is a highly accomplished Engineer, Technical Manager and Leader having successfully completed his Bachelor’s Degree in Aeronautical Engineering from St. Louis University and his Master’s Degree in Business Administration from the University of Miami. Mr. Cooper takes over the reins from the late Henry Woods, who passed away last year. Mr. Grimes also announced that John Fowler is the new Senior Director of Customer Service and Assistant to the Managing Director bringing 17 years of service with the national flag carrier. “He has functioned in numerous capacities throughout the company, having touched many operational areas including serving as Secretary to the Board of Directors, Human Resource Director, and in his current post as Director of Customer Service. “Knowing his vast knowledge and experience within the industry and company, the Board of Directors is pleased to announce the appointment of John Fowler as Senior Director with responsibility for Customer Service. Also newly appointed to his post is Prince Storr, Director of Maintenance & Engineering with 30 years of experience. The Chairman said in addition to the three Executive appointments, Bahamasair has turned its attention to restructuring the Florida Region, as well as ensuring that the Sales and Marketing unit is reinforced to focus its attention on providing developmental strategies that will broaden and improve the revenue base. “As we assemble here this afternoon, together we must continue to chart a new course for a brighter future for Bahamasair. “The Bahamian public expects this of us, and we must fulfil that mandate. The Board and the Government will depend on the collective efforts of the entire Executive Team. 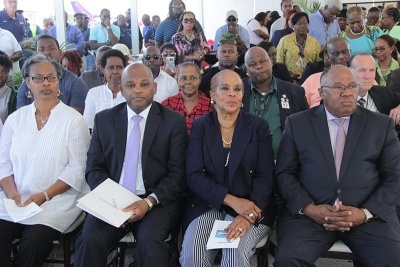 All of you must work diligently and continuously to ensure that Bahamasair is placed on a stronger financial footing.